Payton Tree Service is OUR Recommendation! Bill and Clint are neighbors and we share a huge 150 year old blue oak tree that sits near our common property line. That big tree was overgrown and damaging our roofs. To make matters worse a retired forester, who had cored the old tree a few years before, told us that he had found rot within the main trunk. Two big limbs needed to be taken out to lessen the chance of the tree toppling on our homes in a wind storm. Our city protects old trees and so we had to do something that would keep the city happy while lessening the chance of a disaster. Those two limbs were 25 or 30 feet long and 24 inches in diameter. The process of removing those limbs was going to put our homes in serious danger. Other tree people had looked at our problem. They realized it was going to be a tough job. They informed us that they needed a two week time frame to complete the job adding up to a final bill of thousands of dollars! It was then that a friend recommended Travis at Payton Tree Service. Travis came out and did some serious analysis. He said that he could do the job in a couple of days and his price was very well within our limited budgets. 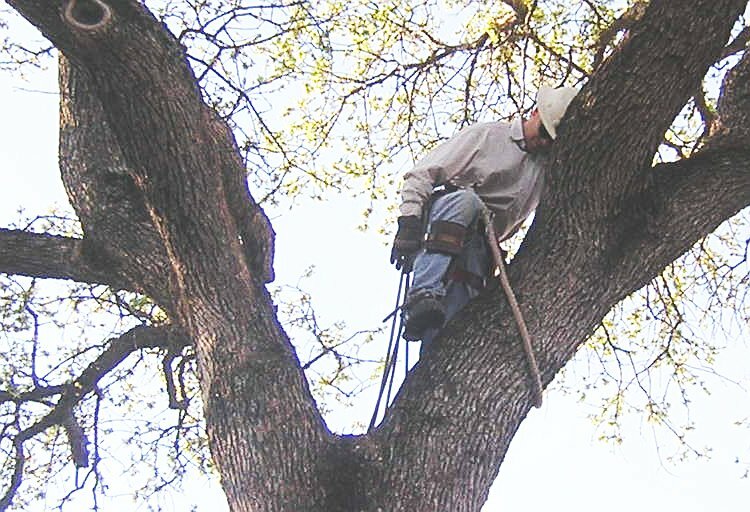 We talked to one of Travis' previous customers and discovered that Travis was indeed a very careful and skilled worker who knew how to keep heavy cut branches from falling onto roof tops. We gave Travis the job and the results were excellent! Travis' courteous, fair and professional services have convinced us that we won't need to look any further when we need help with our big tree next time it needs a trim. Travis has much experience working as a professional tree trimmer. He has learned his craft and spent time working with one of the major "big name" services prior to starting Payton Tree Service. As you can see Travis comes to the job with special ropes, climbing gear and a lot of safety equipment. Here you see him beginning his second and final day of work, ascending the oak. 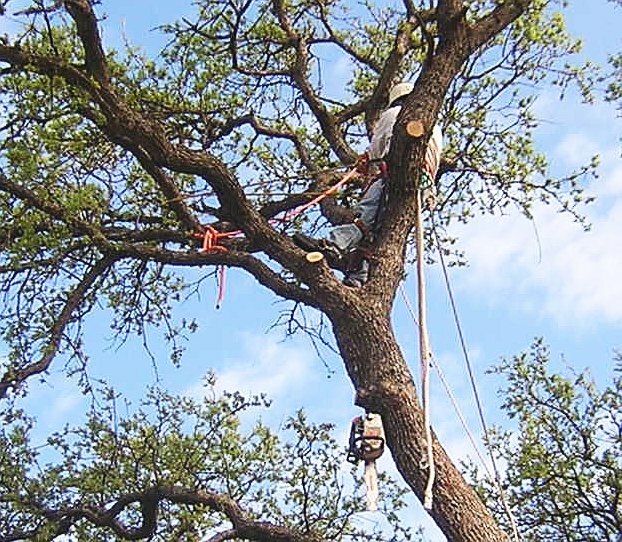 Travis uses a very interesting gizmo that he ties to the base of the tree and a pulley at the top of the tree which work together to safely lower a 750 pound branch segment to the ground. Blue oaks are one of the most dense and heavy woods to deal with. Yet, Travis safely brought down pieces of timber that three men could barely move. Travis didn't have to use a cherry picker or any fancy hydraulic equipment. Instead he moved through the high branches like a trapeze artist on safety ropes. He was meticulous as he figured out just how large a segment of the branch to cut so that it would not swing into a wall, fall through a roof, or strike him when his chain saw finished a cut. Safety was his primary goal. We are so thankful to have a tree man like Travis! Our homes were protected and the old oak is a much safer and better looking tree in the neighborhood. 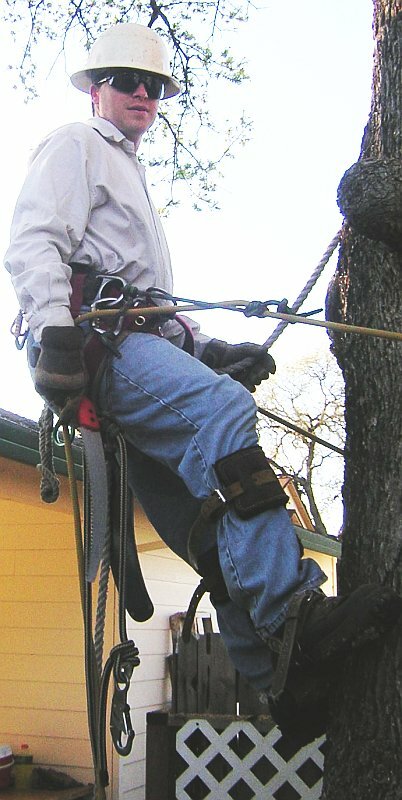 This web page has been constructed as a personal tribute to our favorite tree surgeon. This page has NOT been commissioned nor have we received any remuneration for this web page, other than the fact that the tree is looking so much better. Travis had no idea that he was going to get a testimonial web page when he agreed to take on our problem. 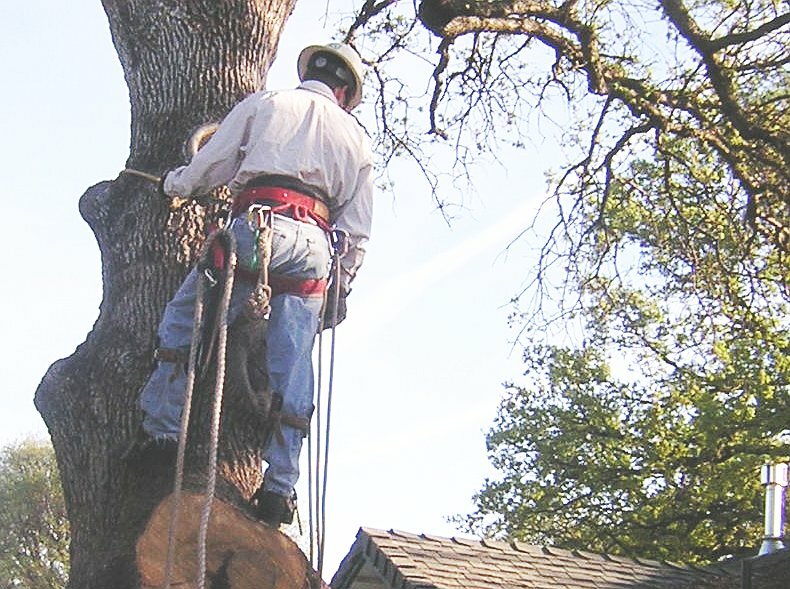 But after he did the job it seemed fitting that others should know that there is a reasonable, safe and very skilled tree surgeon in the North Sacramento Valley between Redding, Red Bluff and Corning. Travis is the man for the job and you are going to be a happy customer if you use Payton Tree Service. Travis' phone number and email address are printed at the top of this page. I have purposely printed his email address in a way that will discourage spam robots from harvesting the address and filling Travis' inbox with spam. If you wish to email him please print his email in the standard manner with an @ sign and a period or dot in the proper place, no spaces and all lower case letters, and REMOVE those brackets [ ] I added too. Below find some more pictures of Travis at work on the old oak. Travis works in the North Sacramento Valley in the following areas: Red Bluff CA 96080, Los Molinos, CA 96055, Corning, CA 96021, , Gerber, CA 96035, Lake California, CA 96090, Anderson, Redding. Tehama and Shasta Counties in California, 120 miles North of Sacramento.